Vanessa's current series, The Renegade Royals, is a national bestseller. The first book in the series, Secrets for Seducing a Royal Bodyguard, received a starred review from Publishers Weekly. PJ here. 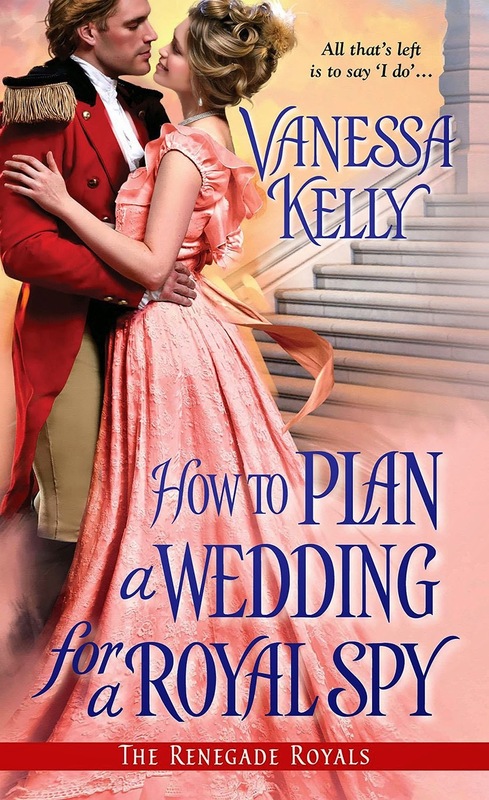 It's always a pleasure to welcome Vanessa Kelly to The Romance Dish. Today, she's blogging about the newest entry in her The Renegade Royals series, Tall, Dark and Royal. It's Dominic and Chloe's story, what I've been longing for since meeting them as teenagers in Lost in a Royal Kiss, the novella that started the series. Welcome back, Vanessa and thank you, thank you, thank you! I got the first glimmer of an idea about my latest historical romance series while reading a biography about the children of King George III. There were mentions of an orphan boy raised at court with the royal princes, an apparently misguided attempt at charity on the part of the queen. It would seem the experiment was a failure, since the princes were anything but charitable to their low-born companion. I couldn’t help wondering what happened to that charity boy, but info was sparse. Still, the idea stuck with me, eventually developing into the main concept for The Renegade Royals—heroes who are the illegitimate sons of England’s royal princes. Their leader would be this charity boy, a man raised with princes. He would know better than anyone how callous his former companions could be, and it would be one of his missions in life to find the forgotten sons and help them establish their rightful places in the world. And so Dominic Hunter, the leader of The Renegade Royals, was born. My editor loved the idea. I originally planned to write six books, with Dominic’s story concluding the series. Once his mission was complete, he would have the time and opportunity to find his own love and happiness. But my editor had a different idea. He proposed four books and two novellas, with the second novella coming between books two and three. And rather than having Dominic’s story come last, my editor wanted it to begin in the first novella—specifically, with Dominic tragically separated from his childhood sweetheart. He would then spend years looking for her, and there would be elements of that search in the first two books. Finally, Dominic would find his true love and his HEA in the second novella, wrapping up his main storyline. Great idea, my editor enthused, don’t you think? Definitely, I enthused right back. And then I proceeded to have a mini-nervous breakdown as I contemplated the complications to the timeline and the multiple subplots I’d have to weave through the stories to make the darn thing work. I ended up with several plot boards, flow charts, timelines, and a whole lot of anxiety that I wouldn’t be able to pull it off. But you know what? It sparked my creativity and forced me to think about my books in ways I never had before. Dominic and Chloe were introduced as teenagers in Lost in a Royal Kiss, the first novella. Obviously, they weren’t the main focus of the romance in that novella but it was where their story began. Dominic’s search for Chloe was then a subplot through books one and two, especially significant in Confessions of a Royal Bridegroom. Readers liked the idea too, and they seemed to eager to find out if Dominic and Chloe would be reunited. Well, in Tall, Dark, and Royal, Chloe comes fully back into Dominic’s life and I personally think it was worth the wait. She and Dominic are two mature adults who must overcome a whole lot of baggage in order to find their life together. I found it to be a very emotional and very satisfying story to write—not easy, mind you, but I was SO pleased with the result when I finally typed The End. I’m happy to say that readers, so far, seem to agree. Tall, Dark, and Royal has gotten great reviews. For that I am very grateful, especially since the whole project felt like a high wire act for much of the time I was writing it. But it would seem that my editor knew what he was doing—sometimes the hardest way turns out to be the best way, whether you expect it or not! Did you ever encounter a difficult situation that drove you crazy but actually turned out for the best? Tell me about it, and I’ll give away an ARC of the next book in the series, How to Plan a Wedding for aRoyal Spy. Your question sounds like every job I have ever been employed for. Crazy times to begin with while you find your ''place'', so many roadblocks along the way until you eventually realise you are an old hand. Then I always seem to move on & do it to myself all over again. LOVE the sound of these books & the storyline. Mary, I totally get that. New jobs can be so intimidating! Hi PJ and Andrea! Thanks so much for hosting me today - love being here, as always! After years and years of heartbreak after heartbreak,we have the best boys you could ask for! You have me reaching for tissues this morning. Blessings to you and your wonderful boys! That is so awesome, made4books! Congrats! Welcome, Vanessa! I'm in the middle of Dominic and Chloe's story right now and loving every delicious bit of it! So glad you're enjoying it, PJ! Being a Girl Scout leader for 5 years about took it's toll on me. Some parents made it hard, but I did it for my daughter and the other girls. After moving to the country, my daughter is now a Juliette (doesn't belong to a troop) and we're loving it. Volunteering can be very tough, Cindyvon - good for you for hanging in so long! Hi Cindyvon! Bless you for sticking with the GS troop for five years. Hanging in there at a bad job is the situation I immediately thought of too... Both my son and I have experienced it and both worked out despite seeming like lost causes at the time. Thanks for the giveaway! I'm so glad it worked out for both of you, lindalou! Glad you and your son were able to make it work for you, lindalou. Congratulations on the new book. I have to agree with others that this usually always happens with a new job or work project. I think our imaginations can often make the prospect of something much worse than it actually turns out to be. I think anytime we're forced out of our comfort zones it seems difficult. But it forces us to change, and usually for the better. I agree, Jan. I happen to think change is a very good thing! Probably when I volunteer which I've done a lot of and then I think "why did I agree to do this" but in the end, I'm always glad I did. I so know that feeling, catslady! Glad you continue to volunteer, catslady and that it ends up being a good experience. At some time or other, I think it does. That would happen more often than one would think, especially in some job situations. I was a L&D nurse for several years, and there were often doctors, patients and families that could absolutely drive you up the wall (made worse by the fact that it was terribly unprofessional to let it show!) but all was forgiven and usually forgotten when the baby had arrived. Stressful and intensely emotional situations do tend to bring out the worst in people, don't they? No... not really... I've been lucky I guess! Congrats to Vanessa on the new release! I really enjoy this series :) Thanks for sharing! The only one I can think of is that when my husband and I first met, we only dated as friends. About 6 months into being friends, we suddenly realized we also loved each other. Lol! Aw, I like that! My late dh and I were friends for almost a year before it turned romantic. I think that foundation of friendship is what made our marriage so strong. Well, I love that song Bless the Broken Road by Rascall Flatts! It took me a long time to meet my husband - I was 30! But it was worth all of the jerks I had to date to get to him! after 18 years I was laid off from my job (it was outsourced & offshored) - trying to decide what to do, I ended up not taking another job and was able to spend a lot of time with my Dad in his final years - it would have been even more stressful if I was trying to hold down a full time job - so maybe that layoff was a blessing in disguise. maybe that layoff was a blessing in disguise. I'd say it definitely was, Di. I'm so sorry about your Dad but how wonderful for both of you that you had that time together. I've got a few situations, but what really sticks out was when I coordinated book fairs when my kids were in elementary school. We didn't just have the books delivered. We went all out with the theme Scholastic was using. We decorated the library, made costumes for the librarian and volunteers, had the teachers wear the costumes so we could snap photos of them in 'character', set up wish lists, got sponsors so kids who couldn't afford books would get gift certificates for the fair, bribed parents into volunteering (chocolate worked very well) and advertised trying to work the theme into all the flyers and posters that we created. A ton of work, but it was more than worth it to see kids get excited about reading. The only thing that cones to mind are the moves my husband and I made with our family. We moved four times and I was always apprehensive and nervous about uprooting our children, but each one turned out to be a positive experience. Looking forward to reading your latest release. Every time I read the blurbs for these books, I know I need to read them. One of these days soon, I hope. I took over putting on our Fall Festival at church. It had sort of faded over the years. I started early trying to get the different ministries to get on board and help plan. Every month only a few people would show up for the meetings, and leaders didn't return phone calls or emails. With the core group of less than 5 of us, we continued to plan. I switched things around from the previous years and planned it out, incorporating what few suggestions we got. Last minute people did come in, two pushing the way they wanted things done, which did make a mess of a few things and cost us extra money. The weather didn't cooperate and we had to close early for a sever thunderstorm. At any rate, It went pretty well and people liked the changes I made. Any complaints were related to the changes those 2 insisted upon and suggestions made were to change those things back to the way we had first planned them. All in all, it was a long project, I learned a lot, and except for getting soaked, lots of people had fun. Well worth the experience. In my case, it was knowing when to keep my mouth shut. I wanted to have a hissy fit at an insurance agent once, but decided not to. It was a good decision, because I had to go over there for more paperwork and information. Lots of embarassment avoided. We have an on-going bad situation. My nephew and his girlfriend had a beautiful baby girl last February. The girlfriend and my S-I-L do not get along. However, Elaine threw a nice baby shower for her new grandchild's mom. At first she( the new mom) would let her see the baby. Now the relationship wih my nephew has ended. The young woman is crazy. She is now bartering visits. Elaine can only see the child if she brings clothes or money. They are going to Court for visitation rights. A sad situation that I'm hopeful will be worked out soon. I'm glad it didn't work out for my nephew this lady is a manipulative *B_ _ _ _*! I lost my job. At the time I thought it was the worse thing that could happen. I became a substitute and beganbworking on my degree. I did not get to finish my degree, but I have had a full-time job in as a special education aide for the last five years. So glad I lost that job.